I used this form when our school was getting reevaluated for charter school. When the administrative team entered my room, students paired up to complete this scavenger hunt using their Treasures part 2 textbook. They asked the children lots of questions, and the children were well prepared to answer them. 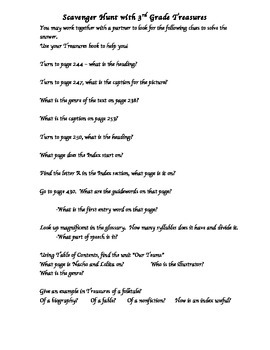 One student replied "I am looking in the table of contents to find what page this story is on." Another stated, "I am looking in the index to find what pages I can find this topic." The leaders were impressed and gave our class nice compliments.